The music of the legendary Motown singer Marvin Gaye has been appreciated by many fans and many more musicians over the years. It’s also gotten a few of those acts into some notable legal issues, but there’s no need to blur the lines here: Gaye, his music and his message remain a key part of the songs we enjoy in 2015. So, I guess it was inevitable that he’s being covered and sampled again even after some people might have been (at least temporarily) scared away from utilizing music of his catalog. In fact, we’re coming upon two different singles, both fighting for pop radio glory, that sample his 1982 smash “Sexual Healing”. Yet, this leads us to a few questions, though the answers won’t reveal themselves for some time. Will both tracks be able to coexist in the top 40 at one time? Will they cancel each other out? Will Charlie Puth and Meghan Trainor‘s recent smash “Marvin Gaye”, which is now descending the chart, play any role in how these two chart runs play out? Let’s take a look at what may happen. Already rising up into the top 20 at Rhythmic radio and heading upward is “The Fix”, a new release from Nelly that also features Jeremih. The latest tune from the St. Louis rapper has also picked up a small group of stations on the CHR radio panel, where it finds itself just below the top 50 and making some gains, albeit much smaller ones. “Fix” marks the debut single for a record label called RECORDS, which is a new partnership between SONGS Publishing and RED Music in the Sony family. Of course, this does mean that the performer is no longer with Universal, whom he was signed to for over a decade. Nearing his 41st birthday in just a few weeks, the ageism of pop radio is likely to take its toll on this track, at least to an extent, but consistent sales in the top 100 on iTunes and almost 7.5 million streams on Spotify are proving that this has some strength in the marketplace. Give it some time; it may just be a surprise sleeper song for the fall. Of course, that sleeper status will, no doubt, be affected by the other single searching for open slots on radio playlists. This one is heading for adds at CHR radio on October 20, but it will potentially start gaining some spins earlier than that. It’s “Try Me”, sung by Jason Derulo and featuring Jennifer Lopez, along DJ/producer Matoma, who you may know from his tropical house flip of a Notorious B.I.G./Ja Rule/Ralph Tresvant song, titled as “Old Thing Back” for the new release. That single was a big hit in Norway and Sweden earlier this year. 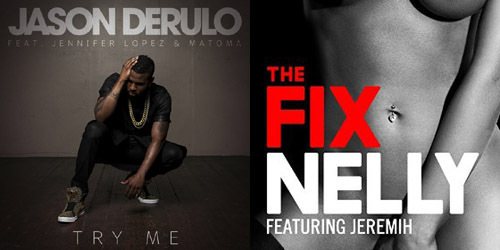 Derulo’s third single from the album Everything Is 4 is his followup to “Cheyenne”, a top 20 single that recently crashed hard due to a lack of sales momentum (and a number of late Q3 singles by top-tier acts debuting at the same time.) We’ll see if that stalling has done any damage to the era, or if “Try” can carry Derulo and company back to the top again. It’s now at 45 million streams on Spotify. This is an interesting situation, to say the least, and it’s one where anything can truly happen given the track records of both main acts involved. We’ll keep you updated on how these new releases do at radio as the year goes on! Until then, follow and like us on various social media sites for more musical mending and record rejuvenation by clicking the Get Social! tab above.